Hurry up, Download West Bengal Sub-Inspector Question Paper 2018. The Exam is complete today. Many Students search for West Bengal Police SI & Lady SI Question Paper. Don't worry, we solve the problem. Here, you can download West Bengal SI Question paper 2018 Exam. This is very important for New Job seekers, who are preparation Next year WB SI Exam. 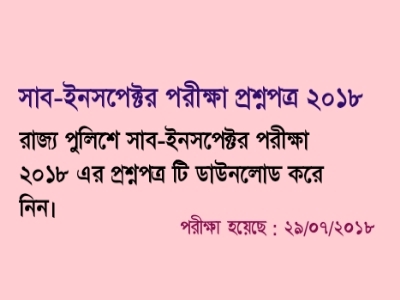 Today GK Solve Share West Bengal Sub-Inspector Exam 2018 Question paper pdf download link. You must download the question paper right now. Solve Paper is coming soon. So Readers, don't late to download this West Bengal SI Question Paper 2018.